Just a heads-up for anyone going to NatCon at Easter. After initially putting a new army cut-off date at 1 January 2012, the Umpire has now shifted that to 1 February 2012. 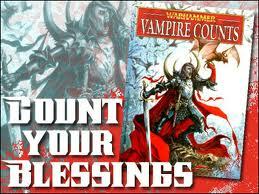 This means that the Vampire Counts will be using the 8th Edition book rather than the 7th . So no Helm, Drakkenhof or spam casting. But you do get better crumble protection, new units and cheaper skeletons. Your Vampires also get an extra attack.